If you're looking for some right royal drama this holiday season, then Yorgos Lanthimos' new dark comedy The Favourite may be just your cup of tea. 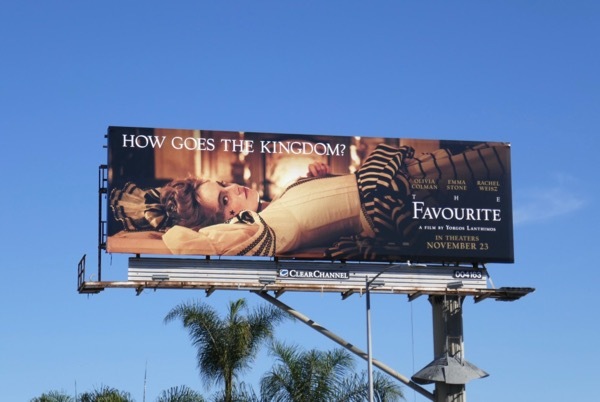 The film is set in the 1700s court of 'Queen Anne', played by Olivia Colman, who is also soon to take over as Queen Elizabeth II in the third season of Netflix's The Crown. 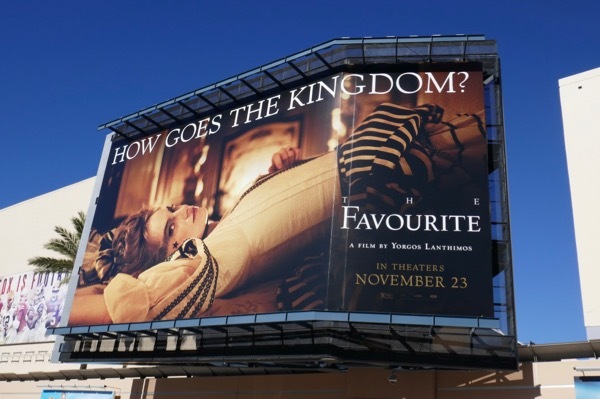 Emma Stone stars as a young woman called 'Abigail' from a disgraced family who journeys to the Queen's palace to ask for help from her cousin, the Queen's trusted advisor (and more), the 'Lady Sarah' (Rachel Weisz). The newcomer to court soon ingratiates herself with the Queen, using all her charms, ambition and sexuality to win over the rabbit-loving monarch, much to her cousin's annoyance, who won't give up her favoured position without a fight. 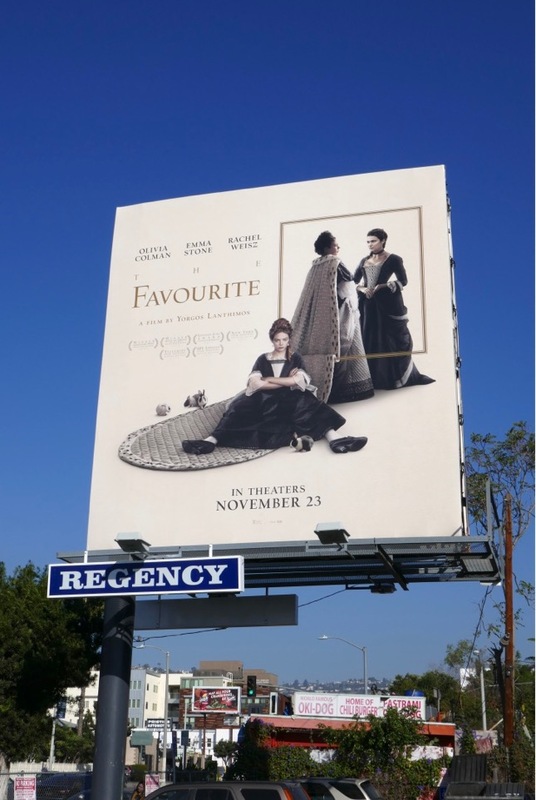 These movie billboards were snapped along Fairfax Avenue, Santa Monica Boulevard and Pico Boulevard from November 21 to November 26, 2018. 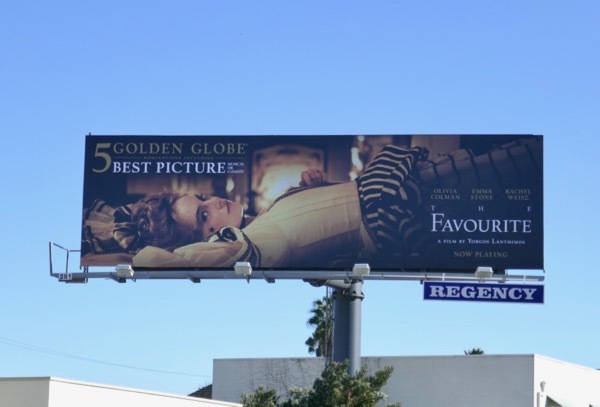 Emma Stone admirers can also check out these movie billboards for La La Land, these film billboards for The Help and these Maniac TV billboards. 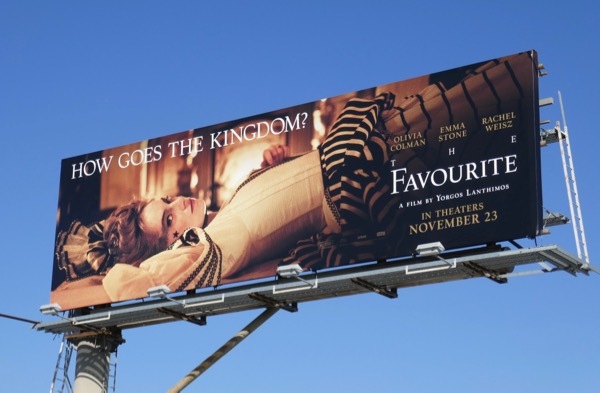 Daily Billboard wonders if there's an Oscar or two in the future for this 18th century battle of wills. At the end of the day, there can only be one favourite. 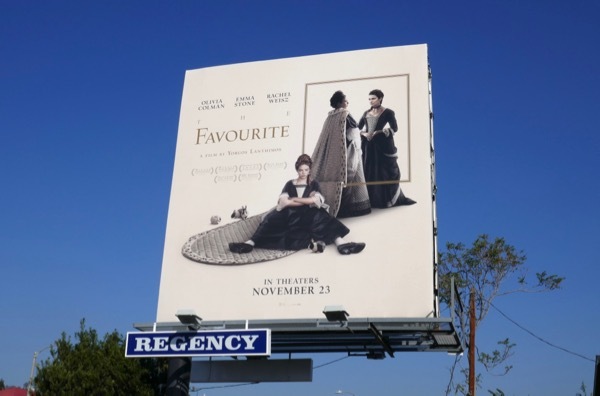 UPDATED: Congratulations to The Favourite and its stars for receiving five Golden Globe nominations, including Best Motion Picture - Comedy or Musical and for all three actresses. 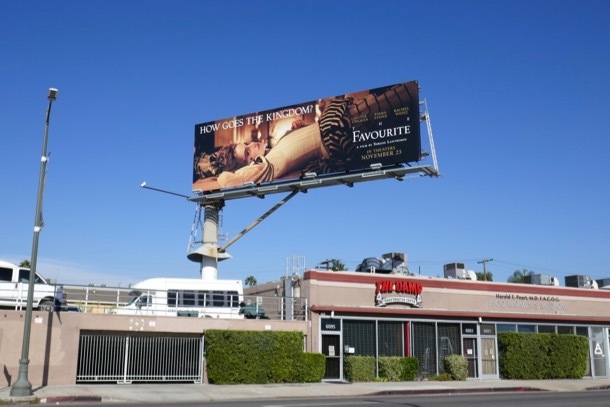 These nominee billboards were spotted along Westwood Boulevard and Pico Boulevard on December 27, 2018.